Is it time to hang up your backpack when you reach your 50s and 60s or even your 70s? Certainly not — not if you don’t want to. Sometimes carrying your traveling gear on your back can be easier than wheeling a suitcase through city streets as well as in the country. So even if the term “backpackers” conjures up visions of 20-somethings bearing heavy loads of camping supplies and sleeping bags strapped on their backs, heading out onto forest trails or tramping around Europe or Australia, this article by Jenn Miller at Jen Reviews may change your mind. Jenn provides a clearly written, comprehensive guide on how to pack for a backpacking trip, filled with practical tips and advice that will save you time, space, and help make your trip even more enjoyable. Besides general packing tips based on factors such as where and when you’re going, what the purpose of your trip is, amenities you may need to bring or pick up along the away etc., she offers suggestions on how to pack for backpacking trips of one week, one month, and six months (or more). The suggestions are geared to both urban backpackers and wilderness backpackers. Yes, the piece seems initially geared toward the younger set, but as she notes toward the end, fit travelers of any age can go backpacking — why let the Millennials have all the fun? While it’s too lengthy to reprint here, you can access her complete guide here. 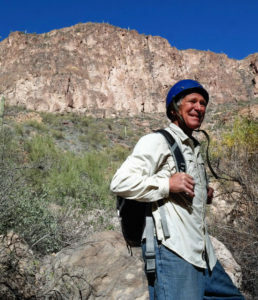 Note to Readers: Where I live in Arizona, I recommend Southwest Discoveries, headed up by veteran Sierra Club guide Mitch Stevens (a baby boomer himself) for backpack-worthy trips throughout the region.